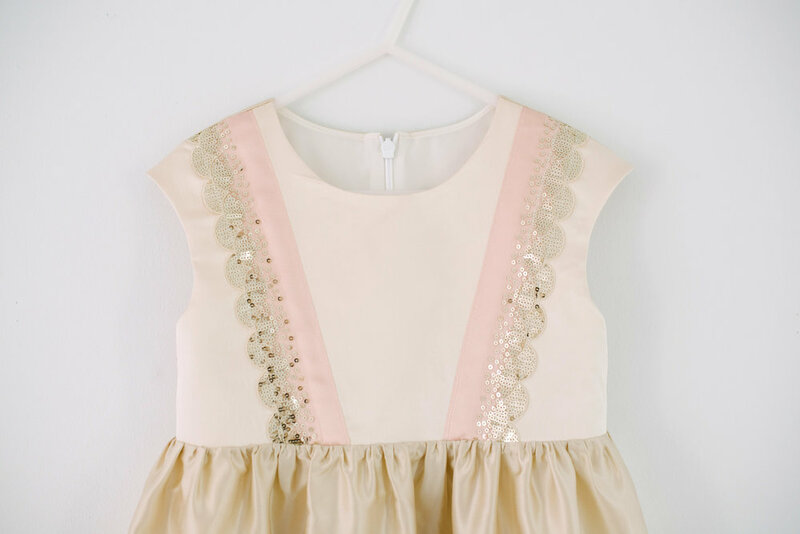 I've been making Geranium Dresses for about 5 years now, since my oldest daughter was born -- it quickly became my go-to dress pattern for little girls. I was excited to hear that Rae was expanding the options and am now honored to be a part of the #geraniumxp fall tour. I pulled together a sampling of a few of my early geranium makes to share. I've made them so often that I don't even have photographs of them all. I actually drafted a sleeve for the 18 -24 month size which you can see below...so I'm so excited to have a sleeve for all of the sizes now! For the Geranium Expansion Fall Tour I made matching dresses for my daughters. 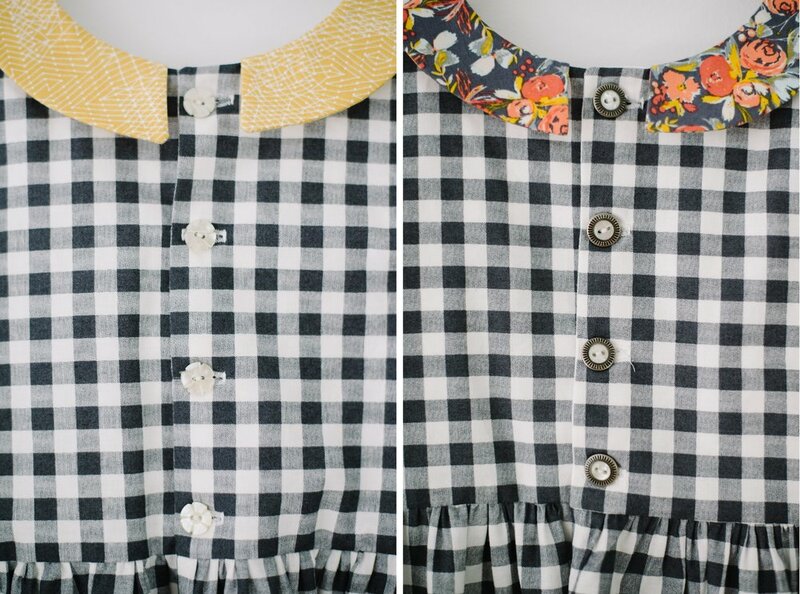 I used a black and white cotton gingham with contrasting collars for the fabric. I found some vintage buttons from my stash to use for the closure. 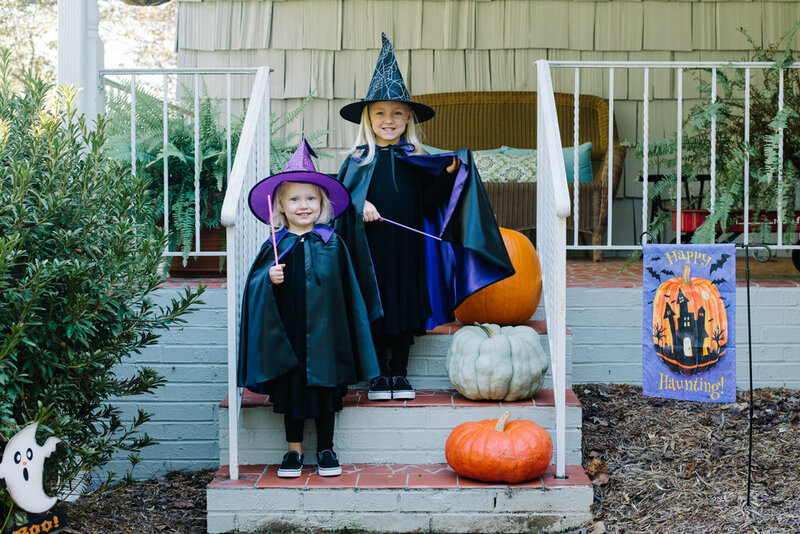 These dresses are perfect for fall and the sleeves work well for the weather transition. I've found that most of my handmade garments are for warmer temps so it's a goal of mine to make more clothing suitable for fall/winter. I recently purchased Grainline Studio's Driftless Cardigan during Indiesew's cardigan week -- and it has quickly turned into a favorite in my closet. I went with this lovely french terry yardage by Atelier Brunette (Twinkle Night) and I'm loving it -- it's super soft on the backside. The pattern whipped up pretty quickly too and I'm a big fan of the pocket placement. I usually get an annual itch to make something for the fall season in the month of July. This year I followed my desires and finished up a few homemade halloween/fall decor items for our house. 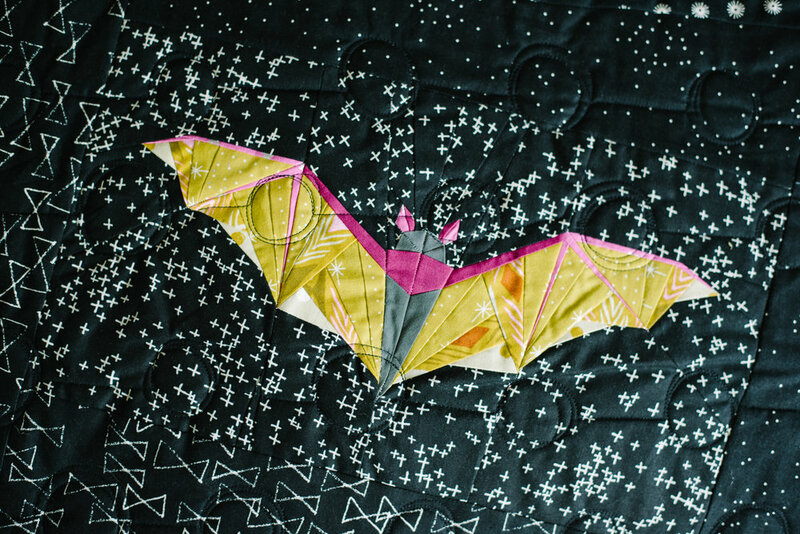 I started this bat quilt last summer and wrapped it up this summer -- better late than never. I used this paper piecing pattern for the bats and pieced them together in a small throw-size quilt for the back of the couch. 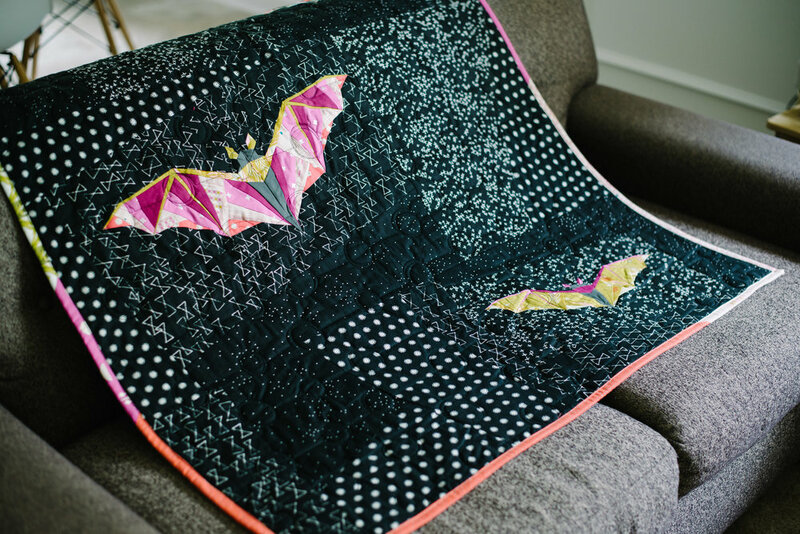 To fill in around the bats, I used a variety of black patterned fabrics and put everything on an angle to make it look like the bats were flying. I put this quilt on the long-arm quilting machine and did a series of free motion circles and lines for the quilting. For the back I just pieced left-over yardage until I got the right size. I'm pretty happy with how it turned out! 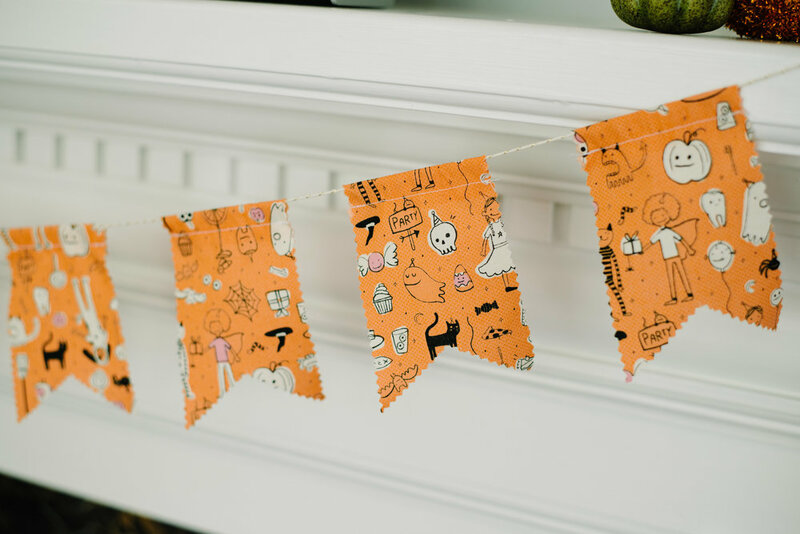 I bought a 1/2 yard of this halloween fabric a few months back with no idea of how I would use it. I usually have a project in mind before I buy fabric, but I love when it happens the other way around. With just a couple of cuts, I made a simple halloween garland for my fireplace. For the rest of the halloween fabric, I used it for the back of this skull pillow tutorial I found on Modern Handcraft. I'm just on a halloween roll now! And lastly, I found these cute pumpkin placemats on Pinterest and figured out a way to make some that are similar. I actually taught a class on them at my mom's shop last week and it was neat to see them made up in a variety of color palettes and fabrics. We used a washable suede for the faces and good thing because my daughter has already spilt milk all over them! In addition to making myself a dress for some weddings we attended this summer, I also put together a couple of fancy dresses for my girls. A few years back I had a line of wedding and bridesmaid dresses and I still have a pretty nice stash of silk and decorative trimmings. 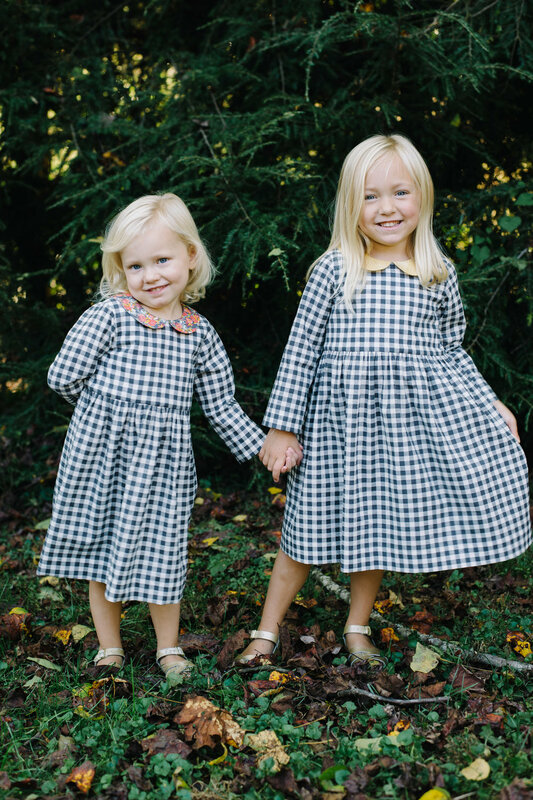 So, I used this pattern to make each of my girls darling little silk dresses. Silk is not usually something I would choose for two little girls headed to a wedding with the main goal of eating cake -- but, I thought that since I had a pretty good stash of it then why not? I did put a layer of netting over the skirt for my younger daughter because she has messier tendencies and I thought that that might hide any drink spills. The most rewarding part was seeing how excited the girls were to wear their dresses. And while they did get pretty dirty, a run through the dry cleaners fixed them right up! I've had the pleasure of participating in the Summer Cleo Showcase by Rae of Made By Rae. Over the past week, a talented group of sewist have taken Rae's latest sewing pattern, the Cleo, and made it up in their choice of fabric. It's been fun to see the different directions others have taken the pattern. For my rendition, I chose a cotton lawn fabric -- a print by Lizzy House from her "Printmaking" collection. I thought a lightweight lawn might give the skirt a breezy feel, perfect for summer. This pattern is a quick make which I'm all about. I chose the longer length with side seam pockets. It features a flat waistband in the front and an elastic waistband in the back which adds to the comfort factor of this skirt. Others have been posting their creations all week so if you'd like to take a look at the rest of the showcase, see the links below.. I recently came across two opportunities to hack my Glory Tee pattern. First, I noticed a shirt of similar design that my mom was getting ready to toss because it didn't fit her quite right. It was a short-sleeved tee with a peplum bottom -- JUST like the Glory Tee. I asked her if I could have it to work a little magic on. I decided to use the size 5 pattern to make a shirt for my daughter. I started with the sleeves and used the existing sleeve (with hem included) to cut the size 5 sleeve out of. Moving on to the front and back bodice -- I folded the front of the shirt approximately on its center front then placed my pattern piece accordingly. I wanted to keep the already completed peplum so I budded the bottom of the pattern piece with the beginning of the peplum. With the remaining fabric from the shirt, I cut the neckband out. The steps to put the tee together were a little different considering the hems were already complete -- but it all worked up pretty quickly! And here's a little before and after..
For the second Glory Tee hack, I did a simple extension to the peplum. By adding around 11-12 inches to the already rectangular peplum pattern, the tee became a dress. Fabric found here. After finishing up my Maker's Tote, I decided to make my daughters matching "Road Trip Cases" (by Noodlehead) for our upcoming vacation. I'm very jealous of the results -- I want my own! I had to hide these cases while I was making them because my girls wanted them so badly. I successfully finished them up and stocked them full of crayons/papers/stickers before our first road trip. This was my first time sewing with vinyl (for the clear pocket) and it was definitely a learning curve. I used tissue paper because it kept sticking to my sewing machine. But after a few times, I finally got the hang of it. Fabric is a mix of Cotton & Steel, Cloud 9, and Art Gallery Fabrics. We've lived in our current house for just over a year and while I love our new home, I have this problem in our master bedroom -- there's no window! The room was intended to be a "media" room so the previous owners boxed in the window to create that dark cinema feeling. Our goal is to eventually put a window back in; but until then, I decided to create a large, light-colored quilted wall hanging as a place holder. This is an improv quilt -- I simply started sewing together a series of fabrics I enjoyed and let the quilt develop on its own. The fabric is a combination of quilting cotton, double gauze, and linen. I titled it "Mountain Gems" because of the shapes and composition. After my first trip to Quiltcon 2017, I was inspired to experiment with my quilting. I quilted certain sections really tight, used different color threads, and incorporated hand quilting. With every season change, my oldest daughter's wardrobe shrinks. That's the advantage of being the first born, no handmade hand-me-downs. I'm hoping to spend the next few weeks replenishing both of my daughter's handmade wardrobes for summer and I recently started with this Maeve Jumper for my four year-old.